The was the fourth match in 2019 already! Playing every weekend is tough for players and managers and there is no easy match in this division. This week’s opposition – Innishvilla is a known quantity for Carrigtwohill’s Under-17’s and the two teams have played out cracking, very competitive matches in recent seasons. This one would not disappoint with Innnishvilla showing superb crisp short passing up both wings, putting massive pressure on Carrigtwohill’s full backs James O’Shaugnessy and Alex Canty for the full 90 minutes with centre backs Ebe Imoh and Sean de Burca on high alert on account of the heavy and uneven surface. The middle of the park also saw a proper “pitch battle” with James Barry, Sidas Pilivicious and Robert Adam competing for every ball in the air and on the ground. In the last 25 minutes, Jack Nolan, David Muller and Adam O’Leary came in to revive Carrigtwohill’s energies. This is a match that was won in front of goals by the team that converted the chances it created. Three times, Carrigtwohill found the way through in the first half whilst Innishvilla’s only reply was a marvellous curling free kick from 30 yards out which Darren Flynn could not get to, with only 10 minutes to go. The outcome might have been different had Darren not managed to punch out at full stretch an earlier Innishvilla effort just under his crossbar. Perhaps the save of the season from the Carrigtwohill goalkeeper! Earlier again, at the start of the second half, Robert Adam produced an amazing save on the line with the head when one of Innishvilla’s tall forwards headed in from close range at the far post. At the other end, it was Carrigtwohill who displayed the most composure: Rian Notley was again a demon on the left wing of the home team’s 1 4 3 3 formation. His hard work delivered a subtle cross in the box which Robert Adam somehow found time to touch down and power beyond the keeper from 15 yards out despite Innishvilla’s tight defence. It was Rian again who drifted left on a counter attack, rounding his opposite number to dash into the box and curl the ball beyond the keeper. Jason Daly also worked very hard on his right wing but it was Abdul Rahim Mohammed playing centre forward for the second match in a row who showed he loves the position, scoring another solo goal, his second in two consecutive matches. 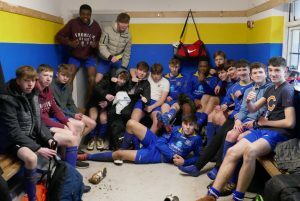 There would be no more goals for Carrigtwohill despite a few half chances, but these were the three that mattered to bring their tally to 10 unbeaten league matches and now five consecutive league wins. A good season so far.